Kineas of Athens is a character based loosely on Plutarch’s Phocion, with some input from G.T. Griffith’s comments on Leosthenes of Athens. Kineas is entirely fictional, but had he lived, he would have been born in 365 BC to an aristocratic family with ties to the Athenian political machine that eventually produced Phocion and Demosthenes. Raised like any gentleman in Athens, Kineas learned to farm and to ride from a young age, took part in athletics, hunted rabbits with his father’s friends, failed to qualify for the Olympics as a boxer, and studied at the Academy first under Plato himself (until 347 BC) and then under his nephew Speusippus. He first served in the Athenian cavalry at the Battle of Tamynae in 348 BC, where the ill-led Athenian hippeis broke and ran when contacted by the superior Euboean cavalry. 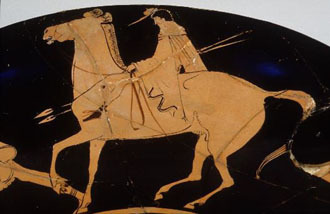 Phocion won the battle despite the total failure of his cavalry, and this incident convinced the young Kineas to take his cavalry service seriously, to study the works of Xenophon and to work on his own martial prowess. From this time dates Kineas’s efforts to master the Pankration, the martial art of Classical Greece, and also his devotion to Phocion and his lessons with the great general in swordsmanship, hoplite fighting, and in the art of war. Kineas served throughout Phocion’s successful Byzantine campaigns, and was present at the disaster of Cheronea in 338 BC, when he was 28, where he was a phylarch. 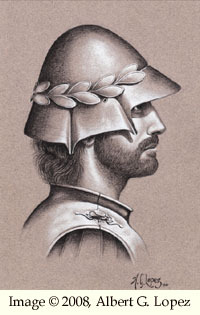 At age thirty, instead of becoming an orator and a politician, Kineas was sent by his father’s pro-Macedonian party to lead the Athenian cavalry contingent with Alexander. Despite winning wreaths for military virtue twice under Alexander, Kineas was sent home with all of the other Greek Allies after Alexander took Ectabana. Kineas arrived home to discover that his father was dead and his fortune seized by the state, and that he himself had been declared an exile by the anti-Macedon faction which had come to power. That very same faction offered to employ Kineas to further their own ends on the Euxine as a condition for restoring his family wealth. The rest of the story can be read in Tyrant and Tyrant: Storm of Arrows.